Michael McCrudden will remain with Institute for the rest of the season. After weeks of speculation Institute have confirmed Michael McCrudden is staying at the club. 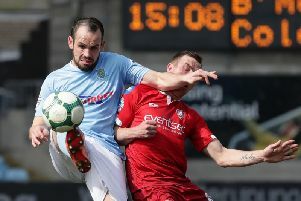 The club released a statement on Tuesday morning confirming the ’Stute skipper will see out his contract by remaining at the club for the rest of the Irish League season. McCrudden was a target for both Derry City and Coleraine but ’Stute have convinced the 26 year-old to remain where he is until the end of the current Danske Bank Premiership campaign. "Institute Football Club can confirm that despite recent interest from a number of other clubs during the January transfer window, Michael McCrudden will remain at the club," the statement said. "This decision has been taken with due regard to the needs and aspirations of the club and the wellbeing of all our players and coaching staff." The Gobnascale man has netted 19 goals this season, winning two ‘Player of the Month’ accolades and has been a major player for ’Stute over the last 18 months. He went on to say: “I’m sure the players are sick answering the questions about what’s going on too. The 26-year-old’s decision to stay will come as a big blow for Candy Stripes boss Declan Devine, who last week insisted he would love to have the player on board for the club’s pre-season trip to Isle of Man.